Break away from the wedding norm with the Escape edition of Modern Wedding Magazine (vol 71). We bring you the greatest ideas to inspire your wedding escape - from the latest in destination weddings and honeymoons, to creating an elaborate escape at your reception to tips and tricks for exceeding expectations for your wedding! This issue is filled with need-to-know information and inspiration for engaged couples and #swoonworthy pictures perfect for your wedding pinboard! We collaborated with some seriously talented people, found the most stunning wedding dresses and even had our own mini Byron escape to bring you the most lust-worthy wedding inspiration! We share three unbelievably gorgeous editorials! Inspired by the Mediterranean magic of Santorini, the boho Byron babe and the vanguard in us these shoots feature divine dresses styled to different tastes all of which ooze style! Ace your wedding fashion and decor style with our tips for how to rock a dress like a fashionista bride, how to dress your maids in only the best dresses and how to style your ultimate wedding escape! Be inspired by couples that created a world of their own at their wedding and start planning your once in a lifetime adventure with our picks of the most uncharted honeymoon destinations! We also give you an in-depth look at one of Australia's very own world-class destination wedding and honeymoon gem with our XXXXX of the ultra-chill Byron Bay. Escape to the wonderfully fun world of wedding photoshoots with our behind-the-scenes video! It's all good vibes, great inspiration and wonderful weddings in this issue! 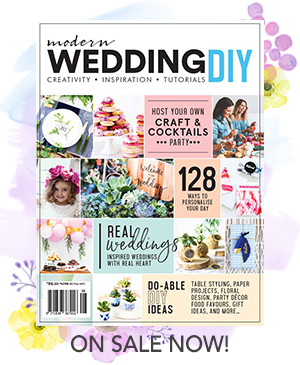 Pick up a copy of the latest Modern Wedding magazine at your local newsagent, selected Woolworths, Coles and online! Don't forget to #snap a picture of what you love in the latest edition and tag @ModernWeddingMagazine #ModernWeddingMagazine on social media to share the love!